First thing we did today was we were just exploring and went to Representative Mazie Hirono's office and dropped off a gift. 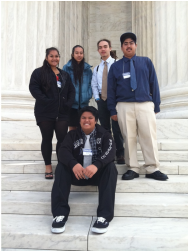 Afterwards we went to the Supreme Court and watched a movie. 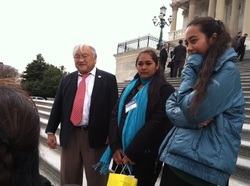 At the Hart Senate we happen to see Mufi Hanneman and he said hello to all of us. 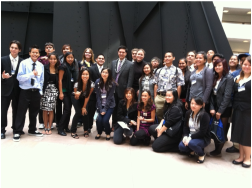 We did our Oli with Upward Bound Maui students and then our hula for Senator Inouye's staff before asking them about issues. We then did our Oli and Hula for Senator Akaka and he talked about what life is like in D.C. for Hawaii residents. 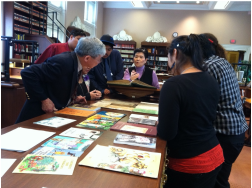 We went to the Library of Congress in the Asian reading room where we looked at rare Hawaiian and Phillipino books. We were priviliged to be there because we were hosted by the director, Dr. Franklin Odo. 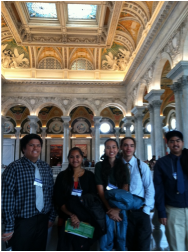 We ate lunch in the House of Representatives Longworth building cafe. It was pretty cool because they have almost all your foods there. 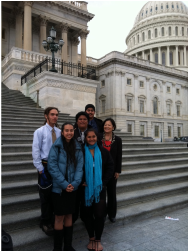 Then we did our oli and hula again in front of the Capitol steps for Representative Mazie Hirono bacause she was ready to vote on a measure and only had a few minutes to spend with us. We had some time to kill so we visited the Botanical Garden where we saw ginger, Pele's hair, cacao, and gigantic papayas. Eesha also found her "new home and PRINCESS GARDEN". She has been elected as a new Congresswoman and Kesha is her secretary. We got back together with our group to eat dinner at Union Station. After dinner we saw a play call "Shear Madness". If you plan on going to D.C. I highly recommend you to watch it; it's very funny. 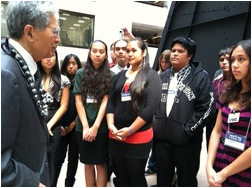 Senator Akaka talking to us.